I was born in Oregon and raised along the Pacific Northwest. I began practicing yoga when I was 19 and my first class was ultimately life changing for me. I did not see then that the path of yoga could take me on this wild journey of self unfolding, but I knew that I wanted to practice yoga for the rest of my life. I knew even then that I wanted to be a yoga teacher someday. I felt this invisible pull, the first time in my life I really felt a connection to my intuition. 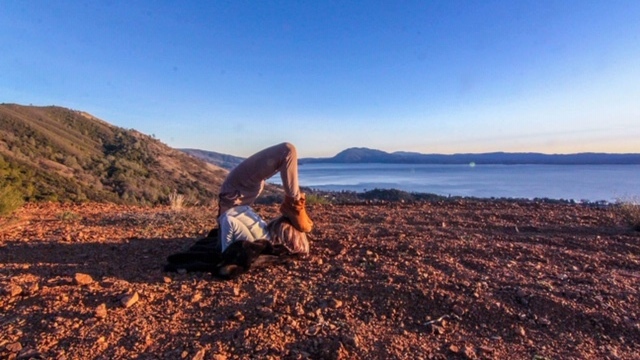 After traveling around Australia, Indonesia, and Europe, I moved to Las Vegas with my partner at the time and began taking my yoga practice seriously; making it a daily practice. This is what led me to my teacher training with Meghan Currie. I joined a yoga competition (USA Yoga) to better my practice and during this, an inspiring teacher told me that when I found my teacher, I would know. I was looking for teacher trainings and one day I stumbled across a video of Meghan practicing in an airport, and I knew. This was again, an unfamiliar trusting in my intuition and now, a deep listening as I allowed it to take me into the unknown. My teacher training was my first real awakening. Blinking my eyes open for what felt like a new birth, I began to really feel my connection to the divine, to the universe, and to all living things. On a lovely and magical small island in Nicaragua, I began to realize I didn’t want to float through life sleeping anymore, that I could really begin to wake up and synchronize with the creation of the life I wanted. I began to realize that I was actually a part of this, these happenings of my existence. Since that first training in 2014, I have felt myself both asleep and awake, navigating through this life as I become more aware and more willing to let go of my old patterns and self imposed hold backs. I have continued to take trainings and learn about the yogic path as a teach and work to always become a better teacher, guided by intuition and wisdom. It is my purpose to align my path with the eight limbs of yoga and to keep practicing always. I want to continue sharing with beings on all paths that yoga is for everyone who feels its pull, and that even if you have no idea where you are going (and who really does?) the practice of yoga can guide your path silently and has the ability to transform from the inside out.